General Observations: With diminishing light levels and cold, snowy weather the end of the season is near at hand. Fall crops and cover crops grow steadily with the late season rains. The final planting of the year (garlic) becomes a priority in the beginning of the month. While crops are still in the ground, markets begin to slow substantially and plans for winter work begin to take shape. Accessing the woodlot to cut cedar trees for fence posts and other firewood becomes a possibility when the ground begins to freeze. November of 2014 was cold with snow in the first week and highs in the 20’s for the final week’s harvest. In contrast to 2012, which brought Sandy and a strong Noreaster, 2014 had no severe storms but a good blanket of snow. November is notoriously unpredictable. Equipment (0 hrs): Interestingly for this month, no hours were recorded. The only field plantings during November are garlic. 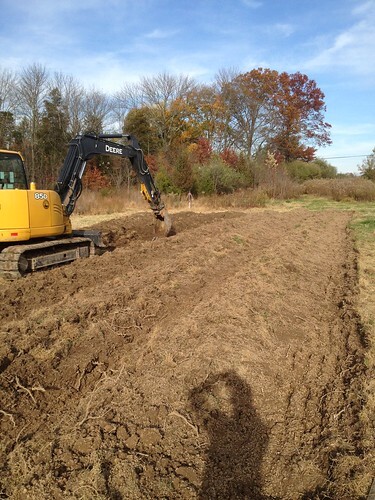 Because the large equipment is primarily used for field preparation during the growing season, fields may have been prepped (mowed, ripped, composted and tilled) after the plans for garlic planting had been drawn up on 8/21. Besides this possibility, lack of hour notation is a potential explanation. Administration (79.5 hrs): Standard payroll, accounting requirements and facilitating tasks to finish the season contribute to these element hours. A more comprehensive understanding of the market totals for the season can be attained during this month and a realistic gauge of the success of the season can be surmised at this time. Discussions with the crew involve their part in the season at hand and the future season to come. Infrastructure (130 hrs): The month began with excavator constructing raised beds in a low lying area on the northwestern side of the 579 field. Standard chicken chores and other livestock maintenance contributed to the hours mentioned. Another critical task during this time of steady frozen temperatures is the drainage of main irrigation lines for the winter. With late season rains and a lack of intense sunlight, the soil tends to stay moist through the end of the market season. Greenhouse (28.5 hrs): Prepping high tunnels for winter is the eventual course of action when freezing rain and snow starts falling. Removing tomato trellising material, digging drainage ditches and securing all end walls are examples of simple tasks not to be overlooked before winter sets in. Composting (3 hrs): These element hours result from instruction hours for the trainees. Operating the tractor with implement in tow helps the crew become comfortable with the equipment. Planting (17 hrs): Garlic planting in Veg B south was the priority on 11/12 with an impending polar vortex in the forecast. Frost heaving in the spring is always a concern for any garlic planting, so reaching a full depth of 5 to 6 inches was stressed to the crew. All garlic planted in 2014 was planted with saved ‘seed’ bulbs from 2013. The variety is German Extra-Hardy. The 17 hours mentioned includes prepping the field and planting 6 – 220’ field rows at a 5’’ spacing with a full crew. See note on planting dates in Marketing section of the summary. Crop Care (8.5 hrs): Frost protecting the crops for market in months like this November are the main priority. Typically crops are covered after emergence and are only uncovered fully during harvest. Harvesting (139 hrs): Unfortunately in November, harvesting time is scheduled for first thing in the morning. Cold mornings, wind, rain and snow were the norm for 2014’s late fall harvests. For the final two harvests the crew was forced to wait until midday to start because the crop cannot be harvested when plant tissue is frosty. One note was an arugula harvest was lost due to foul weather because the crop was too dirty after washing. Handling (33 hrs): The element hours mentioned involved the standard weekly washing. Separating cloves from garlic bulbs saved from the previous year also adds a significant amount of time for November handling hours. Marketing (138 hrs): An interesting note for the end of this market year was the lateness of the final planting (10/3). MR noted planting on 9/1 or 9/15, at the least, would have delivered quality product for the final market. With a late planting, diminishing light levels cause crops to reach maturity at a later stage. Low temperatures also reduce metabolic rates and potentially kill crops. While the crop may be more nutritious for the customer when harvested in adolescence, the farmer receives less product for the labor expended. Special Projects (6.5 hrs): Final work in the high tunnel in preparation for chicken move-in rounds out these element hours for November. Weather: November of 2014 was similar in temperature to the previous two years but with substantially more snow cover throughout the month. Week 1: Cool weather in the 40’s and strong winds prevail for the first week of the month. Week 2: Winter arrives early with lows in the 20’s for every day of the week. Week 3: An arctic vortex ends the final week of the market season putting low temperatures in the teens and highs in the 20’s. Week 4: More winter weather brings an end to the market season. For the crew, not having to handle sharp objects with frozen fingers is a welcome change.